Opus made the “Longlist” for an international design competition for our work with the Groundwater Guardians on the Cape. The competition is the Kantar Information is Beautiful Awards 2018. When I first read about them, I was so excited to see a whole community geeking out over information and data. There are thousands of amazing infographics from different countries in different styles. Our clients were also wonderful geeks when it came to information and data. They had a lot of it. Lots of technical and scientific information and research findings, all very difficult to understand for the “non-professional.” The goal of the Groundwater Guardians is to raise awareness and educate the public about their groundwater. They help people learn how their behaviors affect the water they drink. To this end, they hired Opus to design a series of infographics to help translate this complex information into visuals that are understandable and engaging. Our goal was to make people care about the subject and get involved. The first one, entitled “What is an Aquifer” was one of 601 entries that made the first cut in the competition (there were more than 2600 entries from around the world). When we designed the graphics with the client, we met and had them explain the content to us. Then, we asked lots of clarifying questions and tried to imagine how we might visually explain it to others in the most accessible way. Nitrogen and Phosphorous was a particularly complex batch of content, but the visuals are approachable and fun for anyone to learn. 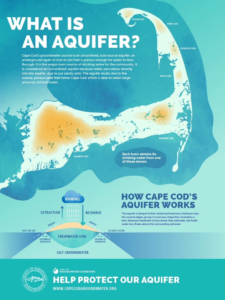 Here are more beautiful, fun and interesting infographics we designed for the Cape Cod Groundwater Guardians.